Researchers at the University of Maryland (UMD) have invented a new stock market design that levels the playing field between high frequency traders, retail investors, and large institutional investors. The new invention, called Market Exchanges with Continuous Scaled Limit Orders, alters how stock market trading occurs, equalizing trading advantages so that high frequency traders cannot dominate the market. 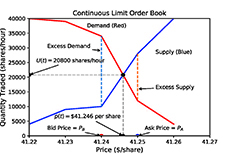 The new system uses continuous scaled limit orders, which make the change in traders’ inventories more continuous as a function of price and time by trading small quantities of stocks over time using very small price increments. “Using continuous scaled limit orders, an institutional investor seeking to buy 5,000 shares of stock might purchase tiny fractions of shares at an average rate of one share per second, at prices calculated to small fractions of one cent,” said Kyle. By organizing the system in this way, the speed of technology a trader uses does not matter, eliminating the ability of high frequency traders to make profits through the virtues of faster technology. However, in addition to making the market more fair, the new system also saves resources by ridding traders of the advantages of high-speed technologies, which require enormous amounts of resources, and the system also allows traders to replace the millions of messages traders send to buy and sell stocks with one single message, conserving economic resources. Market Exchanges with Continuous Scaled Limit Orders was invented by Kyle and Jeongmin Lee, Assistant Professor of Finance in the Olin Business School at Washington University in St. Louis and former graduate student at the Robert H. Smith School of Business. The invention has been nominated for the Invention of the Year award in the information sciences category, for which the winners will be announced at the 2018 Innovate Maryland celebration on April 11. Learn more about Innovate Maryland and the Invention of the Year Award nominees. Kyle, Albert S., and Lee, Jeongmin. (2017). Toward a Fully Continuous Exchange. Oxford Review of Economic Policy, 33 (4), 650 – 675. UMD is home to more than 37,000 students, 9,000 faculty and staff, and 250 academic programs.